Slash has completed recording sessions for his new album, according to singer Myles Kennedy. "We just finished a record,” Kennedy tells WRIF 101.1 FM Detroit. “Actually, I just finished my vocals for that last week, so there's another record in the can. And it'll probably come out later this year." The set will mark the guitarist’s third studio release with Myles Kennedy & The Conspirators and the follow-up to 2014’s “World On Fire”, which debuted and peaked at No. 10 on the US Billboard 200. Working alongside producer Michael “Elvis” Baskette (Alter Bridge, Iggy Pop, Incubus), the guitarist plans to release the project this fall in sync with a North American tour. 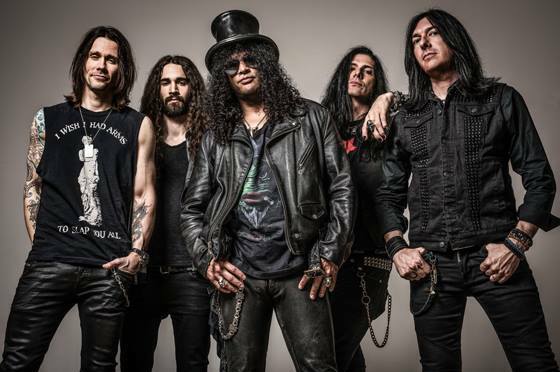 “I'm excited about the new stuff we put together for this next record; it's got some cool songs and it's got a great live feel,” Slash explained recently. "I've been working with Myles, Brent and Todd for about 8 years now. It's been an amazing ride so far; as a band we continue to get better which is great. Kennedy is currently on the road playing shows in support of his solo debut, “Year Of The Tiger”, while Slash will regroup with Guns N’ Roses for a 7-week summer tour of Europe that will begin in Berlin, Germany on June 3.